Chill all ingredients. Combine schnapps and nectar in large bowl. Squeeze in juice from two limes and stir. Add seltzer and champagne just before serving. 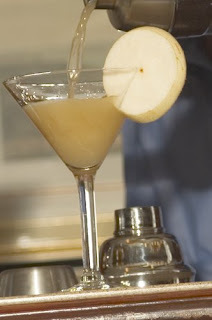 Garnish with pear slices..
Really yummy cocktail! You have a wonderful blog!